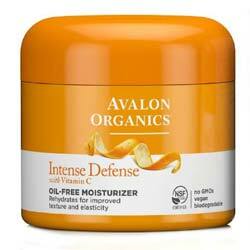 According to the manufacture Avalon Organics Intense Defense with Vitamin C is an oil-free moisturizer that replenishes skin and promotes a more radiant appearance. The moisturizer is manufactured by Avalon Natural Products, which also specializes in other natural skin care products that promote well-being. Aloe Barbadensis Leaf Juice: From the aloe plant, this ingredient is known for helping heal wounds, burns, and treat acne. It is revered for its moisturizing properties and can be used on sensitive skin. Cetyl Alcohol: Fatty alcohol that keeps emulsions together so they won’t separate into their distinct components. Stearyl Alcohol: Fatty alcohol that prevents the separation of emulsions. Cocoa Seed Butter: From the cacao bean. Contains a healthy amount of fatty acids that replenishes the skin. Can help heal dry skin, chapped lips, and prevent skin from flaking off. Arnica Montana Flower Extract: Prevents the flaking of skin. Ascorbic Acid: Vitamin C. Boosts production of collagen and elastin for more supple skin. Speeds up the skin’s ability to heal and helps make sunscreen more effective. It also has many antioxidants that help repair damaged skin and prevent further skin issues. Tocopheryl Acetate: This conditions and protect the skin. However, since this is a synthetic form of vitamin E, it may irritate the skin. Apply to clean skin twice daily until it’s absorbed. The manufacturer recommends using sunscreen during the day if expecting to spend time in the sun. Many of the ingredients used in Avalon Organics Intense Defense with Vitamin C have been recognized for their skin benefits. Does not clog pores and can be used daily. Although there are very few reviews backing up this claim. Contains no synthetic fragrances, phthalates, and parabens. Prices can vary greatly depending on where one lives and customers can’t compare costs to that of the purchasing directly from the manufacturer, which doesn’t publish costs. Some customers may not be able to return or exchange the cream if they purchased the product from a store without a comprehensive policy. Although the product has many effective ingredients, the brand doesn’t provide information that can corroborate that this product protects the skin as is claimed. Avalon Organics Intense Defense with Vitamin C has many ingredients and qualities that can improve the skin’s condition. However, it has Glycerine that may cause Severe allergic reactions like rashes, difficulty breathing, tightness in the chest and swelling of the mouth, face, lips, or tongue. Although the product is vegan, includes no GMOs, and synthetic fragrances and colors. The manufacturer doesn’t publish its MSRP online, which might cause consumers to pay different prices or be subject to uneven return policies.